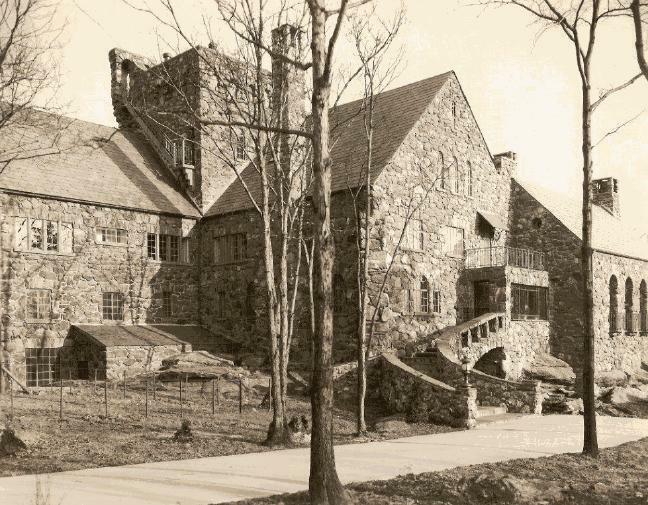 Since the days of the Dutch to more recent times, Ossining and its neighboring areas has been the site of magnificent homes, estates and other properties that are or once were owned by prominent New Yorkers. Many of these people were attracted to Ossining for the relatively inexpensive cost of land, the commanding views of the Hudson River and the easy commute to nearby to New York City. However, because of reduced personal circumstances, as well as changing tastes and life styles, many of these homes and estates are just memories. Most have been demolished and replaced by newly built condominiums or other types of housing developments and several are now abandoned ruins. One of the more interesting in the latter category is “Elda”. It was once the home of David Thomas Abercrombie, the founder of the Abercrombie &amp- Fitch Company, and his wife, Lucy Abbott Cate. They married in 1896 and had four children. Elda is actually in the Town of New Castle but, for reasons best known to the US Postal Service, it has an Ossining address. David Thomas Abercrombie was born in Baltimore, Maryland on June 6, 1867 and was the second of 10 children born to Scottish immigrant parents, John Abercrombie and Elizabeth Sarah Daniel. David was a civil engineer by training and started his career as a surveyor, mapping routes for various railroads through the scarcely populated mountains and forests of the southeastern part of the United States. It was this experience of living in the wilds for days and weeks on end that drew him to what eventually would become his life’s work. After much experimentation with outdoor equipment of the era, he decided to establish the Abercrombie Company- a manufacturing and retail business dedicated to specialized, high-end, hunting, fishing, and camping equipment and clothing that met his exacting requirements. Accordingly, he located his establishment at 36 South Street in downtown Manhattan, hard by the sail-making lofts that produced the canvas he needed for his tents. It was also close to the banks and stock brokerage houses of Wall Street’s tycoons and others who could afford his quality wares. There he met a wealthy lawyer named Ezra Fitch and they collaborated in setting up a firm that would bear their names. The Abercrombie &amp- Fitch Company later became the preferred outdoor outfitter for America’s elite. They provided almost everything that Richard E. Byrd, Robert Peary, President Theodore Roosevelt, Amelia Earhart, Ernest Hemingway and many other famous people needed for their explorations, safaris and other trips into the wilds of the Americas, Africa, Asia and the Polar Regions. Early on, however, the partnership soured as both men argued about how to run the business and Abercrombie quit the company in 1907, selling his share to Fitch. He continued his association by manufacturing some of the outdoor products this company sold. Mr. Fitch believed that the future of the enterprise lay in expansion and in selling to the general public as opposed to just the niche market of well-heeled explorers and other outdoor professionals that Abercrombie had in mind when he launched his business. Abercrombie felt that his core business model was good enough and later, in 1908, he established the David T. Abercrombie Company at 311 Broadway. He did well selling quality goods for explorers and sportsmen but by 1916 there were war clouds on the horizon and, being an adventurer and a patriot, he used his connections to pursue a military post. On September 6, 1916, he was commissioned with the rank of Major in the Quartermaster Reserve Corps. He then sold his business and began his brief military career. During the fall and winter of 1916, he acted as an instructor in the Quartermaster Corps, training reserve officers for active duty in this branch of the service. He then was called to active duty on July 30, 1917, where he was the officer in charge of the Packing Division of the New York Depot, Quartermaster Corps, United States Army. There he put considerable thought and energy into his assignment, the undoubtedly huge and daunting task of shipping clothing, equipment, and other war material and supplies overseas to the American Expeditionary Forces in France. Major, later Lieutenant Colonel, Abercrombie was in charge of thousands of civilian employees who turned out an average of six thousand uniform-size packages per day. It was an unprecedented logistical effort in terms of its scale and complexity but there was probably no one else in the Army who could have done it more efficiently, effectively, and ingeniously than he did. In essence, he figured out a way to pack 20 cubic feet of material into 4 cubic feet of space and saved the government millions of dollars in shipping costs over the span of the conflict. After the war, Mr. Abercrombie resumed his business but by the mid-1920s, he was semi-retired and had the time to be a more active member of several scientific and scholarly organizations. 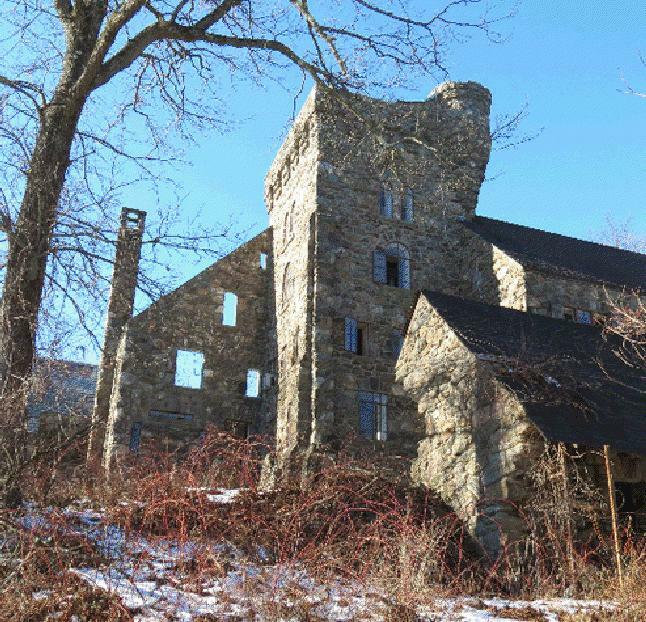 In addition, he and his wife Lucy decided to buy property in the Town of New Castle in Westchester County and build a rustic but well-appointed home that reflected their love of outdoor pursuits, including horseback riding and shooting. In this regard, while in residence in Westchester County, he was the founder of the Dirt Trails Association, having conceived the plan and the engineering of a public bridle path through adjoining estates in Westchester County. Accordingly, the owners of the land through which the bridle path was cut named it in his honor using the initials of his name, D. T. A. He also had a firing range built on the property and allowed local police to use it for target practice, since in addition to other posts he was a police commissioner of the Town of New Castle and president of the Westchester County Police Revolver Association. Another service he offered was for the priests and brothers of the Maryknoll seminary, who he allowed to come and swim at a small pond on Elda. Elda, the name they gave to the estate, is derived from the first letter of the names of each of their four children, in birth order: Elizabeth, Lucy, David and Abbott. One of these daughters, Lucy, named after her mother, met a tragic death in her father’s 3-story factory building at Ossining, New York on November 27, 1929. Apparently, she was working with a solution of gasoline and paraffin at the laboratory when a spark set off the mixture. She was taken to Ossining General Hospital where she died. There was a Memorial Room named for her but it is no longer there, as the hospital was demolished some years ago. Son David also died as a result of an accident when he was kicked in the abdomen by a horse on his ranch in Wyoming in 1937.
have the name of a company called “Land Clearing Associates” on them. However, there is no doubt that Abercrombie’s experience as an engineer and land surveyor came into play in the placement and construction of Elda. In any event, the house evolved from their ideas, the natural materials on hand, and the steel that came from Mrs. Abercrombie’s father’s iron works in Baltimore. Horace Abbott (July 29, 1806 – August 8, 1887) was an iron manufacturer and banker. His work included the armor plating for the USS Monitor, several other naval ships, and the great iron tension band around the base of the dome of the U.S. Capitol that is still in place. Work on Elda began in 1925 and was completed two years later. It was first occupied in late January 1928. The house, built on a rocky promontory still stands in the middle of what is now a 22-acre property. The house is principally constructed from the abundant granite and other natural stone found on this land. At that time, the house had some twenty-five rooms including servant’s quarters. There were four sections with intersecting gables as well as a section with a hipped roof. Some areas were not covered at all. The interior walls were made of cement that laid over a rough course of natural stone. The floors are also cement over steel beams and rebar covered by wood flooring and, in some cases, by tiles. Some of the roofs are slate while others are asphalt shingles. The house has a number of arched and squared doorways and windows, curved stone and iron circular staircases, exposed stone chimneys, and vaulted spaced masonry porches. The arched, squared and rectangular windows are steel casement and are set deeply in the walls in rows or singly. In addition, there are two off-center, clear-glass, oeil-de-bouf (bull’s eye) windows about 18 inches in diameter on the exterior wall of the southern end of the formal living or “great room.” This large space, with exposed wood beams, hanging tapestries, green tile floor and big fireplace, hearkens back to the romanticized ideal of great halls in medieval castles. Two of the larger arched windows in this room open out to small, step-out balconies with elaborate wrought iron balustrades with gates that swing out. The room is 35’ L x 20’ W and the peak of the ceiling is 24’. The floor, built directly on bedrock, was covered with pale grey and black marble ties. The layout of Elda consists of two stories of living space with three rectangles. There is one with a gabled roof running east-west, with a square tower sitting behind it, rising above the gable roof. Another rectangular wing extends to the north with a north-south gable roof and another rectangular wing extends south with a north-south gable roof. There is an open court yard or patio area that was intended, in part, to look like a ruin and in that section the windows are cut into the wall but not glazed. Other features include an open patio with a fireplace and cast iron spiral staircases leading to the upper reaches of the tower. There is some speculation that the now-open area where the dining room was resulted from an explosion at the building in the early 1940s but as yet no documentation for this event has been found. There is a covered patio with a hipped roof with supporting stone arches reminiscent of the other gothic architectural elements of the building. Tiles with whimsical heraldic and other images decorate its walls, fireplace chimney, and several small cast iron ducks line the metal railing of granite steps leading up to the southeast entrance to the house. Intentionally or not, the building seems to reflect Abercrombie’s ancestral Scottish roots since Elda in many respects appears to be a typical tower house of medieval Scotland. For instance, Elda has an overhanging, wall-mounted battlement structure projecting from one corner of the building. These “guerites” or “bartizans” were common features on the walls of medieval fortifications from the early 14th century up to the 16th century. The main entrance of the house is on the west side and is accessed by a flight of curving stone steps that lead into a glass-enclosed vestibule that also served as a conservatory for Mrs. Abercrombie’s plants. Beyond this vestibule is the “great hall” alluded to earlier. It once had bookcases with leaded glass doors and other furnishings that came from Abbottston, Lucy Abbott Cate’s ancestral home in Baltimore. The first floor included an office, kitchen, a now-gone dining room with a fire place, a butler’s pantry, two small bathrooms, and five bedrooms for the servants. Below the house at ground level was a basement that was entered by a doorway on the east side of the house. It contained the boiler room, a laundry room and a three-car garage. Upstairs on the second floor were four family bedrooms, an enclosed sleeping porch, a small living room with a dumbwaiter, four guest rooms and four bathrooms. There were some additional rooms in the tower section of the building. One of these was the Gun Room where Mr. Abercrombie kept his fabulous collection of antique and special hunting rifles. A door in this room led outside to a set of iron steps that took one to the top of the tower with views of the Hudson River and the Maryknoll Seminary. The tower also held a ten thousand gallon water tank with a pump in the basement that lifted water from springs on the property and distributed it to the rest of the house by gravity. By all accounts, Elda was a great place to be for the immediate and extended family as well as for friends and other visitors who took advantage of its comfortably rustic and sophisticated ambiance in a natural setting that included three ponds, riding and hiking trails, and views of the Hudson River. On August 29, 1937, David Thomas Abercrombie died after a long bout with rheumatic fever at age 64. He was buried at Green Mount Cemetery in Baltimore, MD. A simple U.S. government-issued headstone marks his grave. Also inscribed on this tombstone is his wife, Lucy Abbott Cate Abercrombie, who is buried with him. She died on June 3, 1955. After Mr. Abercrombie died, Mrs. Abercrombie moved in with her daughter, Elizabeth, who lived in New Jersey and Elda was unoccupied for several years until it was sold in the early 1940s to a firm doing research on paints. After WWII the building remained empty for more than a decade and became the target of vandals. Among other depredations, they poured left-over paint on the marble floors of the dining room and other rooms in the central part of the house, setting them afire and causing great damage. In 1964, James Harrick, President of Harrick Scientific Company based in the Village of Ossining, purchased Elda for $15,000 and began to rehabilitate it. Mr. Harrick’s ultimately failed attempt to restore the house to its former glory was a costly and frustrating experience and after he died in the late 1990s, his estate sold the property to Corliss Lamont, Ph.D. and his wife, Beth, for $1.510 million in 2001. Dr. Lamont was the scion of J. P. Morgan chair, Thomas W. Lamont, but the young man rejected his capitalist origins and began an academic career as a socialist philosopher and radical dissenter. After he died in 1995, Mrs. Lamont became the owner and she tried to make a go of it by turning the place into a conference and retreat center called “Half Moon Foundation Castle.” This was not a financial success and late in 2011 she sold it to an investment group called the Morgan Immovable Trust for a reported $3.75 million. As of January 2012, Elda remains empty. It is not known what the new owners intend to do with it. 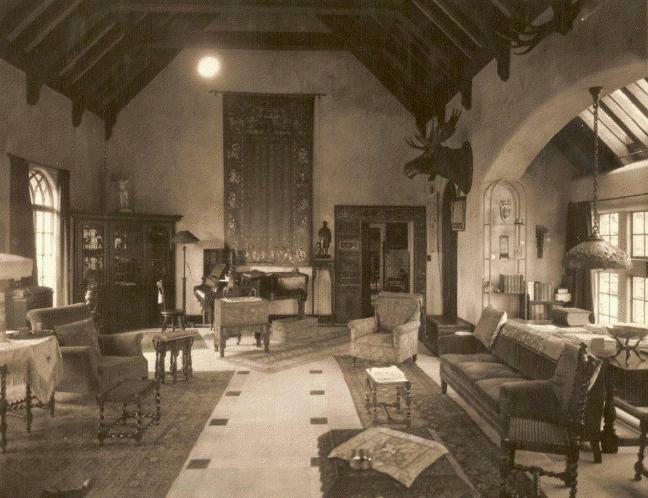 Photos: Above, Elda in 1928 (Courtesy of Douglas Leen)- middle, Elda’s Great Room circa 1929 Courtesy Douglas Leen)- and below, Elda as it appears in 2013 (Courtesy of Miguel Hernandez). Wonderful history and great photos. How could such a place remain empty? Corliss Lamont would have wanted it filled with Occupy Wall St., Environmental Defense Fund militants and Pete Seeger’s folk song army. My daughter, decked out in Abercrombie and Fitch T-shirts will now have to endure me telling her the whole story — she just can’t avoid history, its everywhere, thanks to Miguel Hernandez and crew.